Christmas, more than any other time, is for the gathering of families to celebrate the joy that the season brings. For many at the Rome Rescue Mission, there is no home, no family, and no joy. Children cannot experience the joy of Santa because no one can afford a gift for them and to many, Christmas day brings only more loneliness and misery. The good news is, it doesn’t have to be this way, with your generous donation of twelve dollars you can provide Christmas for a child at the Rome Rescue Mission. A traditional Christmas meal, a visit from Santa, a toy, and celebrating the birth of baby Jesus can all be made possible with a donation of just twelve dollars. The Mission is in need of Hams, potatoes, yams, mayo, pasta, sauce, dinner rolls, butter, bacon, eggs, juice, fresh fruit, bagels, items for tossed salads, dressing, chips, dips, cheese, and crackers for our annual Christmas meal. Monetary donations are also accepted, checks can be mailed to PO box 337, Rome NY 13440. Donations are being accepted Monday – Friday at 413 East Dominick Street from 9AM – 6PM and Saturday-Sunday 9am-2pm. 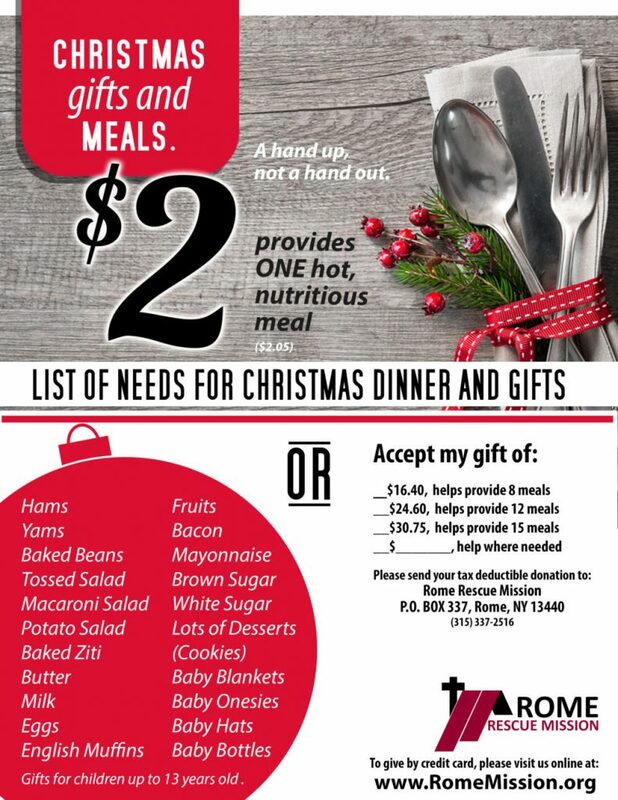 The Rome Rescue Mission Christmas sign up is scheduled for November 5th- November 8th from 10:00-3:00 at 413 East Dominick St. Rome NY. Any child in our community, up to 13 years old is eligible to sign up to have Christmas gifts provided to them by the Rome Rescue Mission. Parents ID is required. This event is made possible by generous donations by our community. We will contact the parents when gifts are ready to be picked up. The public is welcome to all events. For more information, contact the Mission at 315-337-2516.